Welcome to Romania's capital, Bucharest, it is a lively city full of history and life. This evening, join your fellow travellers for a dinner at the hotel. Included is a one-night stay in Bucharest. Today in the morning, you will drive through the streets and boulevards of Bucharest in a guided city tour. After the tour, you will transfer from Bucharest to Giurgiu, where a warm welcome awaits you from your Captain and crew as you board your Emerald Waterways luxury river cruise ship. Tonight, join your Captain for a welcome dinner. Today your ship will cruise to Rousse, once at the port take a coach ride to town of Veliko Tarnovo and Arbanasi. Veliko Tarnovo, was the former capital of the Bulgarian empire known once as the 'city of the Tsars'. Visit the historic town of Arbanasi perched on a high plateau overlooking the Yantra River and lined with traditional houses. The town is known for its 17th and 18th century churches and many examples of Bulgarian National Revival architecture. Tonight, join your Captain for a welcome reception and dinner. 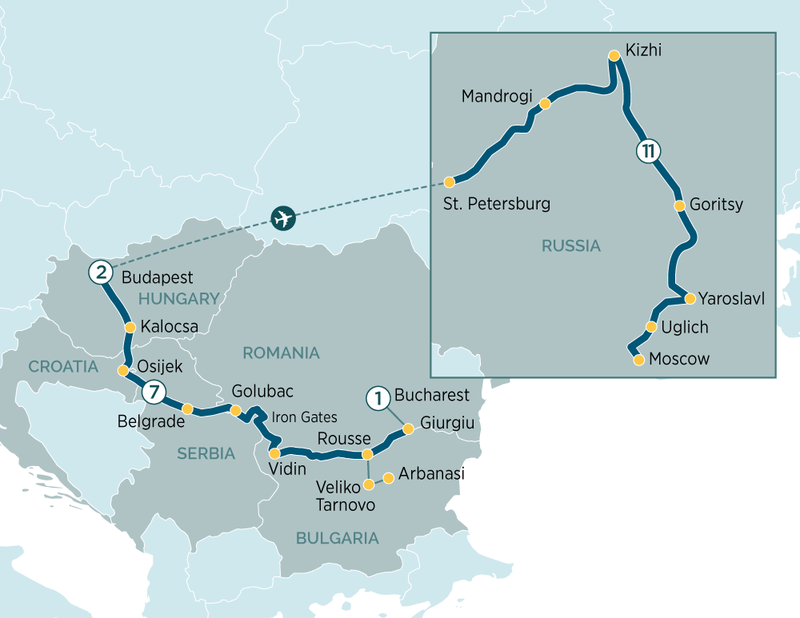 Today sail towards the narrow gorge between the European Alps and Carpathian Mountains, known as the Iron Gates. Then visit the archaeological excavation site Lepinski Vir. Located on the right bank of the Danube in the Djerdap gorge (The Iron gates of the Danube) near the town of Donji Milanovac, Lepenski Vir was the centre of one of the most complex prehistoric cultures. Rich cultural layers reveal traces of a highly developed culture that had complex social relations and as such was the first discovered urban settlement in Europe. Cruise into the border region of Croatia today, an area that was heavily damaged during the Croatian War of Independence at the end of the communist era. Compare stories back at the ship and enjoy an evening of sailing further upstream towards Hungary. Tonight, join your Captain for a farewell reception and dinner. Arrive in Kalocsa, one of the oldest towns in Hungary, famous for the production of paprika. This morning, visit a local Puszta Horse Farm and enjoy a performance showcasing the exceptional riding skills of Magyar horseman. After breakfast, disembark the ship and transfer to your hotel in the vibrant city of Budapest. Enjoy a guided tour of the city sights including the Hungarian Parliament Building, the Buda Castle and the Chain Bridge linking Buda and Pest. Transfer to the airport (flight not included). Founded by Peter the Great, St. Petersburg was the capital of the Russian Empire for more than 200 years. Nicknamed ‘Venice of the North’, the historic centre, threaded with canals dotted with baroque bridges, is a UNESCO World Heritage site. You will be met and transferred from the airport to your traditional Russian river cruise ship, MS Rossia, where a warm welcome awaits. After breakfast, your guided bus tour will take you along the Nevsky Prospect, the main boulevard of St. Petersburg. You will pass the Gostiny Dvor (St. Petersburg largest department store), the National Library and the monument to Catherine the Great, the sights of the Church of the Savior on the Spilled Blood, the Kazan and Saint Isaac’s Cathedral. Tonight, your Captain is delighted to host a welcome cocktail with sparkling wine. Your day will start with a visit to the Hermitage Museum. Rival to the Louvre in Paris, the Hermitage Museum is one of the largest and oldest museums in the world. Formerly the Winter Palace and home of the Tsars, the museum’s collection comprises of nearly three million exhibits including the largest collection of paintings in the world and early collections dating back to Catherine II. The day is yours to continue exploring the main sights and attractions of St. Petersburg or just enjoy and relax on board of MS Rossia. Today we visit the picturesque village of Mandrogi located on the River Svir. The charming landscape is dotted with colourful “izbas” – wooden houses with finely carved roofs and window frames. The town also offers many of opportunities for you to admire items of Russian handicrafts, such as pottery and Today we visit the picturesque village of Mandrogi located on the River Svir. The charming landscape is dotted with colourful “izbas” – wooden houses with finely carved roofs and window frames. The town also offers many of opportunities for you to admire items of Russian handicrafts, such as pottery and the famous “matryioshka” dolls. You will also have free time to enjoy some of Mandrogi’s other attractions, like the Vodka Museum, which contains thousands of different brands and types of one of Russia’s most famous exports. Today you will cruise Lake Onega, Europe’s second largest lake, and arrive at the small island of Kizhi. You will be taken on a walking tour through the Kizhi Architectural Ensemble, housing a collection of restored 18th century Russian wooden buildings, including the breath-taking Church of the Transfiguration. Built in 1714, the structure of the Church was built without a single nail. Today we arrive in Goritsy, a typical Russian village set in the most scenic countryside. Take a coach from the ship to the Kirillo-Belozersky Monastery. Founded in 1397, by Cyril, one of the most honoured saints in the Russian Orthodox Church, the monastery houses the Assumption Cathedral and many ancient icons, which were loved by Ivan the Terrible. Founded in the 11th century by Yaroslav the Wise, the ancient city of Yaroslavl retains many monuments of its noteworthy and colourful past. Your walking tour will take you through the historic center, a World Heritage Site, which is located at the confluence of the Volga and the Kotorosl Rivers. Visit the 17th century Church of St. Ilya the Prophet, an incredible structure filled with frescoes and classic Russian architecture, then wander the grounds of the 12th century Saviour-Transfiguration Monastery, one of the oldest along the Volga. Your day starts with a visit to Uglich, one of most beloved towns in Old Russia, which is part of the Golden Ring around Moscow. Throughout its 1000 year history, the town has been used by various Monarchs including Ivan the Terrible as a base for attacks on the Tatars and Poles. During your walking tour you will visit the renowned green-domed Cathedral of Transfiguration. Then, visit the Church of St. Dmitry on the Blood, which was built on the site where Dmitry, the youngest son of Ivan the Terrible was murdered. This evening, the Captain will host a farewell dinner. Welcome to Moscow, Russia’s capital city on the banks of the Moskva River. The city’s architecture is a reflection of its 860 year old history with many reminders of both its imperial and Soviet past. A sprawling metropolis, Moscow is the financial and political centre of Russia with a population of around 13 million inhabitants. You will have a city tour where you will have a chance to see Moscow’s main highlights, including the sights of the Red Square, where you can see the brightly colored St. Basil’ Cathedral from the outside, sights of the Lenin Masoleum and the State Historical Museum. Today we have one of the biggest highlights to your tour, a visit to the Kremlin Grounds. For many people the symbol of Moscow and indeed Russia, the Kremlin is the former seat of the Russian Government and a unique historical, architectural and artistic reserve. During a stroll around the Kremlin Grounds you will see the majestic Cathedral Square which still retains its original form. Then, you will have a tour of the State Armoury, which houses priceless weaponry, jewels and royal artefacts. In the afternoon, you will visit the Cosmonautics museum.